Ok Corral Here We Come! This tall artificial desert cactus is straight from the Mohave desert, well it could be if it wasn’t fake!! What a fake too!! This is simply so stunning that words fail me! This is something completely different and unique and the way they’re selling they won’t be around for long! The superbly detailed and designed cactus is made of rubbery resin that has been perfectly coloured and finished that you really would think you were in a western movie, but without the prickles, snakes or excessive heat! This is marmite– I LOVE IT! But many won’t! Put it in the bathroom, or in the conservatory. I’ve put them in the sitting room to give some colour and as a feature piece it cannot be beaten. Because of its tall thin shape it really does and can fit in any space in any room. Measures 172cm tall. DUE TO ITS SIZE IT HAS TO GO AS A SPECIAL SHIPPING ITEM Please do take a look around our on-line store as there are hundreds more wonderful items to be seen. 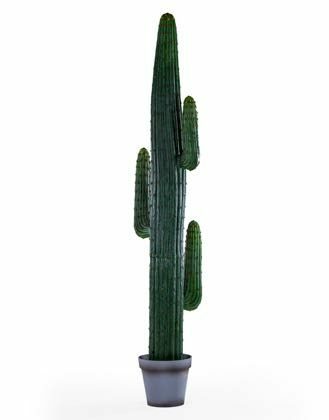 If this tall artificial desert cactus is not what you are looking for, we have a lavish selection of gifts, mirrors, French furniture, lamps, chandeliers and vintage style home accessories that will inspire you. Updating a bedroom perhaps? Starting afresh in an exciting new home? Revamping a living room? Or simply adding refreshing feature accents to your home, we are your one stop vintage shop!